Thank you for your interest in the Social Skills Group after school program. If you want to sign your son up for group, I will need you to click the “Survey” link below and fill out the form. After the survey is filled out, please download the appropriate paperwork on the list and email it to katie@katieovercash.com. 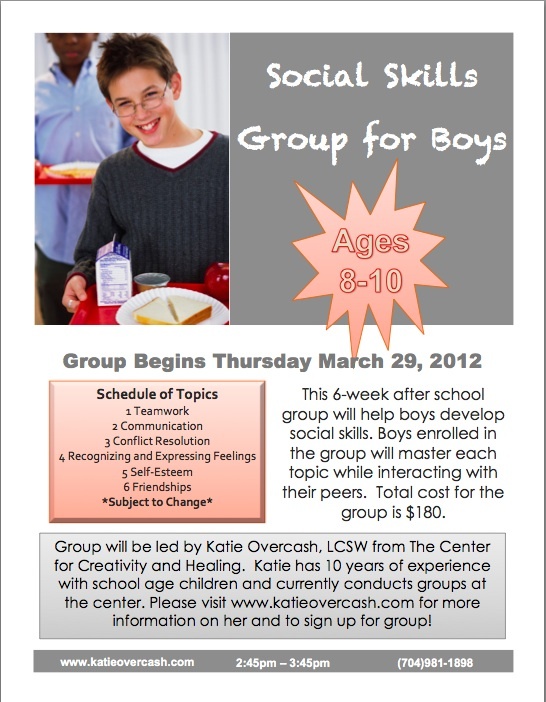 Please note that your son cannot begin group on March 29 until all of the paperwork is turned in. Please remit payment to Charlotte Christian School only. If you have any questions, feel free to call Katie @ 704-981-1898. I look forward to working with your son in group. 1. Fill out this Survey. This entry was posted in Uncategorized and tagged Charlotte Christian School, communication, Conflict resolution, decision making, making friends, recognizing feelings, self-esteem on July 22, 2012 by katieovercash.